Sun’s Out. Gun’s Out. Grill’s Out! Are you ready? The May 2-4 weekend means different things to different people: camping, lazing on the patio, partying with friends, reading a book or just getting to throw on a pair of flip flops and shorts. But regardless of your May 2-4 preference, one shared pleasure is and always will be grabbing the tongs, turning up the heat and biting into a deliciously juicy piece of meat! To ensure you will be touted as the weekend’s undoubted Grill Master we’ve compiled a list of tips and tricks to amplify your summer sizzle! Aside from helping your food taste better, acidic marinades actually protect against heterocyclic amines (HCAs), carcinogens that are most often caused by cooking poultry, red meat or fish over an open flame. Using vinegar, citrus juice, or even beer as a base, let your meat soak for at least a few hours before throwing it on the grill. Also be sure to keep the lid closed to trap in the heat and smokey flavours! It’s pretty stunning, but some people toss cold meat on a cold grill and then fire it up, none the wiser. By letting your steak-maker heat up for about 20 minutes, you’re allowing both the grill and the surrounding metal to come up to an even temperature, which leads to more efficient, controlled and safe cooking. Prior to grilling, scrub the hot grate with a long-handled wire brush. This keeps it clean — and ensures neat grill marks. You cook with oil when you’re making something on your stove, so why would outside be any different? Often times, leaner cuts of protein, like fish, tend to stick to the grates of your grill. Defend against it by using a pair of tongs to rub a paper towel soaked in cooking oil over the grates. An alternative method is to brush your food with olive oil and season it with sea salt before it goes on the grill. 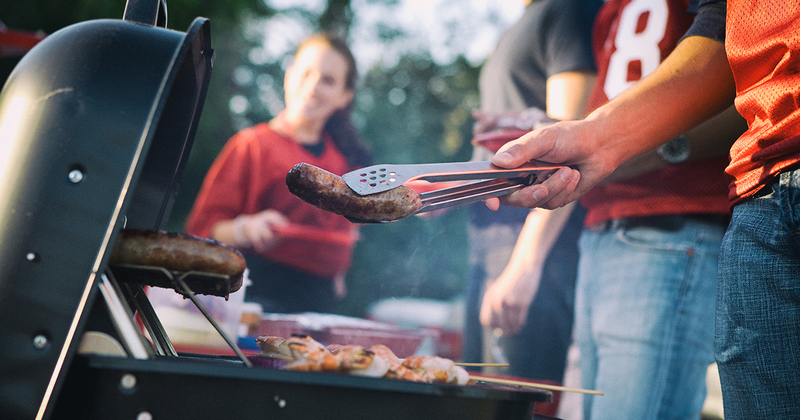 Once you put food on the grill, try not to touch it. If timed correctly, meats — especially burgers, steaks and chops — are meant to be flipped just once. After placing something on the grill, let it sit for a few minutes to get a good sear. Once it’s been cooking for a bit, use your tongs to test and see it if pulls away from the grates. Assuming you oiled it, the meat will “release” when it’s cooked long enough. If there’s any resistance, it needs to be left alone a few moments longer. If it’s a sweet sauce (like classic BBQ sauce) add it once your meat is almost fully cooked. You don’t want to cook sweet sauces too long as they will burn. If it’s a non-sugary marinade, you can baste meant as often as you like! We know, you’ve been doing this for years. But you’re still susceptible to poorly cooked meat. Even the professional’s use a thermometer, and you should too. An excellent digital thermometer is one of the most important pieces of equipment you can have as a grill master - other than a grill. Want more tips and tricks? Check out the London Beer & BBQ Show at the Western Fair District June 17-19, featuring cold brews, grilled foods and party games!